Not too long ago, James and I finally hit up this restaurant in our town, called the Stage House Tavern. Billed as the oldest restaurant in New Jersey (it’s been in operation since the 1700s), the place is pretty charming. The menu isn’t quite what I expected – I guess I was thinking along the lines of the Liberty Tree Tavern in Disney World. Silly me! Instead, it’s part steak house, part fine Italian restaurant, with freshly made pastas and prime cuts of beef. On our first visit, the specials menu drew me in. Tops on the list? The ground sirloin burger with Jarlsberg cheese and a housemade Sam Adams Octoberfest Beer Barbecue Sauce. Hello! 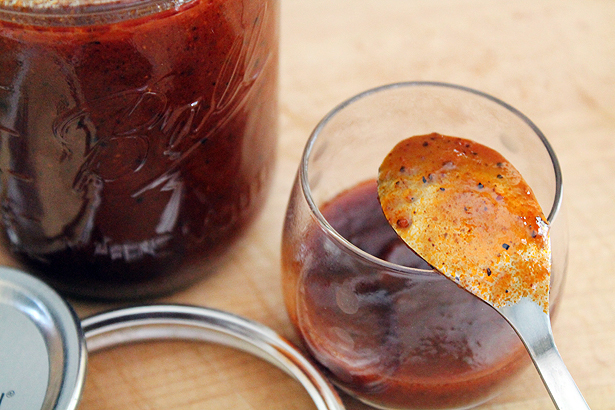 Biting into that burger, I was taken over by the tangy, earthy, wonderfully just-the-right-amount-of-spice sauce and knew I had to try to recreate it at home. 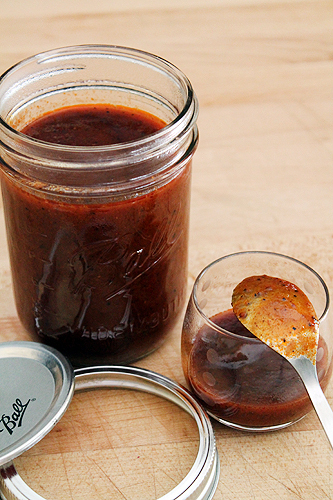 Why have I never made my own barbecue sauce? That was the first thing I asked myself after putting it together. 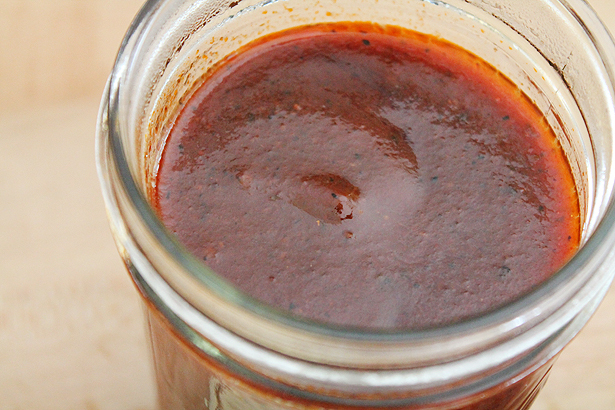 Barbecue sauce has to be one of the easiest things in the world to make. And it sure as heck took less time to make than searching the grocery store shelves for a bottle of sauce that doesn’t contain HFCS. I’m sharing this today because I thought maybe you might have a few leftovers (turkey, stuffing, ham, mashed potatoes, pie..) that it would taste fabulous on, and give your palette some new flavors to get those leftovers eaten. And who knows, you may have a few bottles of Oktoberfest hanging around too! Stir ingredients together in a small sauce pan. Bring to a boil, then lower heat and simmer for 20 minutes until flavors are fully combined and sauce has reduced and thickened. Keep in an air tight container in the refrigerator. I used a mason jar. Shh… Don’t tell Darron about this. Otherwise, he will demand that I make barbeque sauce every week. He puts it on everything. This sauce sounds awesome! I love the idea of using it on Thanksgiving leftovers, which I’m starting to get sick of. I also want to make BBQ pizza with this sauce now thanks to Casey’s comment, LOL! I love that the first thing you thought of when imagining a Colonial-style American tavern was something from Disney World. HEEEEE. P.S., I’m DYING for a BBQ burger now, but I’m making the KAF beer pizza dough tonight instead. Of course I did. It’s me! So long as it’s kept in a covered container and in the refrigerator, I believe this sauce will last for a month or two. I’ve had mine for a month now, and it’s still good. I haven’t made BBQ sauce before either! Weird…thanks for reminding me!